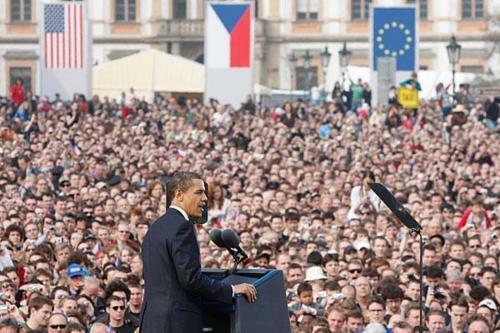 Two years ago today, on April 5, 2009, President Obama delivered a major speech in Prague on his vision for U.S. nuclear weapons policy. Most boldly, he stated “America’s commitment to seek the peace and security of a world without nuclear weapons,” while cautioning that reaching that goal might not happen in his lifetime. Pursuit of the New START arms control agreement reducing U.S. and Russian strategic nuclear forces, which entered into force on February 5, 2011, and is a signature success for the Obama administration. The possibility of further reductions in nuclear forces, seeking to include all countries with nuclear weapons, a goal that has proven more elusive. Ratification of the Comprehensive Nuclear Test Ban Treaty, which would ban nuclear explosive testing. The Senate must support ratification of the treaty, but the administration has not yet pushed for a vote, in part because achieving New START ratification was more difficult than expected. Pursuit of a multilateral treaty to verifiably ban the production of fissile materials for nuclear weapons, a goal that has been held up by Pakistan in part because of a U.S. agreement with India to enhance nuclear cooperation between the two countries. Secure “all vulnerable nuclear material around the world within four years.” Significant progress has been made on this front, including pledges—some already fulfilled—made by 47 heads of state at a 2011 “nuclear security summit” in Washington, but more needs to be done. The last commitment has, in some ways, proven the most elusive. For example, the debate around New START was entirely focused on Cold War issues. But in the long run ending Cold War thinking is the only way to dramatically improve U.S. security. Nuclear weapons are the only threat to the survival of the United States. For the United States, nuclear weapons are a far greater liability than an asset. The administration had one major chance to end, or at least shift, Cold War thinking. In 2010, it released its Nuclear Posture Review (NPR), which described its nuclear policy goals. Unfortunately, while the NPR was a significant improvement over earlier reviews, it missed several opportunities to make even more dramatic improvements in U.S. policy. Below are four specific issue areas where, as the administration implements the NPR, it could make further progress on ending Cold War thinking. The NPR states that the “fundamental” role of U.S. nuclear weapons is to deter a nuclear attack on the United States or its allies and that the goal is to make the deterrence of nuclear attack their “sole” purpose. It also states that the United States will not use nuclear weapons against any non-nuclear nation that is a member in good standing of the Nuclear Nonproliferation Treaty (NPT). This is a sensible step, but the United States should now go further in clarifying the purpose of its nuclear weapons by declaring that it maintains nuclear weapons for the sole purpose of deterring the use of nuclear weapons against the United States or its allies. The Obama administration has stated that the United States will “work to establish conditions under which such a [sole purpose] policy could be safely adopted.” But there is no reason to delay this important step. The NPR mentions only one concrete step to reach this goal: to strengthen U.S. conventional capabilities. The United States already possesses the world’s most capable military many times over and is developing significant new capabilities for the future. A reliable and credible U.S. nuclear deterrent does not require the ability to retaliate immediately but only the assurance that U.S. nuclear forces and command-and-control systems would survive an attack. Yet current policy requires U.S. nuclear weapons to be maintained so they can be launched within the flight time of a Russian ballistic missile, and Russia has a similar capability. Although the risks of an accident, unauthorized use, or miscalculation are low, docu¬mented problems with the Russian command and control system suggest that the United States has an interest in moving Russian toward a more stable posture that does not rely on high rates of alert for survivability. More generally, both sides recognize that with the end of the Cold War requirements have shifted away from deterring deliberate attack by the other. U.S. security would best be served by eliminating the requirement for prompt launch and by no longer maintaining options for launching U.S. nuclear weapons within a matter of minutes. Any president should have days to make such a momentous decision. Under such a policy, the United States would no longer develop or exercise plans for rapid launches and would replace such plans with new ones that would delay a nuclear response to a nuclear attack for days. The NPR calls for analysis to set goals for future reductions of all types of nuclear warheads and nuclear delivery systems. While New START will result in important reductions in deployed strategic weapons, the United States and Russia have many thousands of additional nonstrategic and/or stored nuclear weapons that are not covered by any treaty. But tactical nuclear weapons can be no less destructive than strategic weapons. Furthermore, rapid rearmament is possible if deployed weapons are simply transferred to storage rather than retired and dismantled. For these and other reasons, the next round of U.S.-Russian nuclear reductions should seek to establish a single, verifiable limit on the total number of nuclear weapons for each nation. This overall limit would be in addition to a sublimit on the number of deployed strategic weapons. A total U.S. stockpile of 500 to 1,000 nuclear warheads, including both strategic and tactical (and deployed and non-deployed) weapons, is more than enough to deter nuclear attack by any current or potential adversary. Agreement on such a treaty may take time. In the interim, the United States should revise the guidance on nuclear roles and missions in a way that permits deeper nuclear reductions and allows for the reductions mandated by New START well ahead of the treaty’s 2017 implementation deadline. The NPR also states the United States will consider reducing its non-deployed weapons as it moves forward with its new stockpile stewardship and management plan. These reductions should begin now and the U.S. should encourage Russia to reciprocate. The United States still deploys tactical nuclear bombs in five European NATO member countries. These weapons are a vestige of a Cold War policy that called for large numbers of U.S. tactical nuclear weapons to deter a massive Soviet conventional attack on Western Europe. In the twenty-first century, these weapons serve no military function not already addressed by other U.S. military assets, as senior military leaders have said. The NPR notes that any decisions about the future of those warheads (such as returning them to the United States) must be made by NATO. The United States should state that NATO’s security and the U.S. nuclear commitment to NATO do not require forward-deployed nuclear weapons in Europe and actively support the immediate consolidation and ultimate withdrawal of these nuclear bombs from their European storage sites.